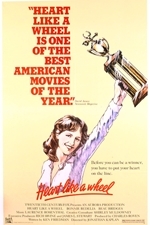 Heart Like a Wheel is a 1983 biographical film directed by Jonathan Kaplan and based on the life of drag racing driver Shirley Muldowney. It stars Bonnie Bedelia as Muldowney, and Beau Bridges as drag racing legend Connie Kalitta. The film garnered two award nominations: Bedelia for a Golden Globe Award for Best Actress - Motion Picture Drama, and William Theiss for an Academy Award for Costume Design.